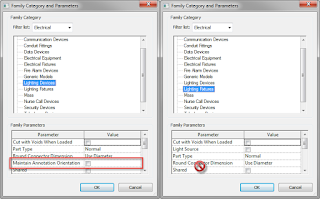 For reasons that are still unknown to me, Revit does not allow, to date, the use of the setting "Maintain Annotation Orientation" on two family categories: lighting fixtures and electrical equipment. This is particularly painful for the electrical discipline because so much of the documentation on plans is symbolic. Perhaps the thought process was that since light fixtures and electrical equipment is usually more than 6 inches in size that the use of nested annotation symbols wasn't necessary. Or maybe the programmers just didn't catch that those two family categories acted differently and haven't heard the howls of complaint from the industry? Regardless of the reasons, it has left the MEP industry in a state where workarounds are needed in order to properly annotate plans. I'm talking about true annotation symbols and not just using symbolic lines in the model family. Symbolic lines won't scale automatically based on the scale of the view. 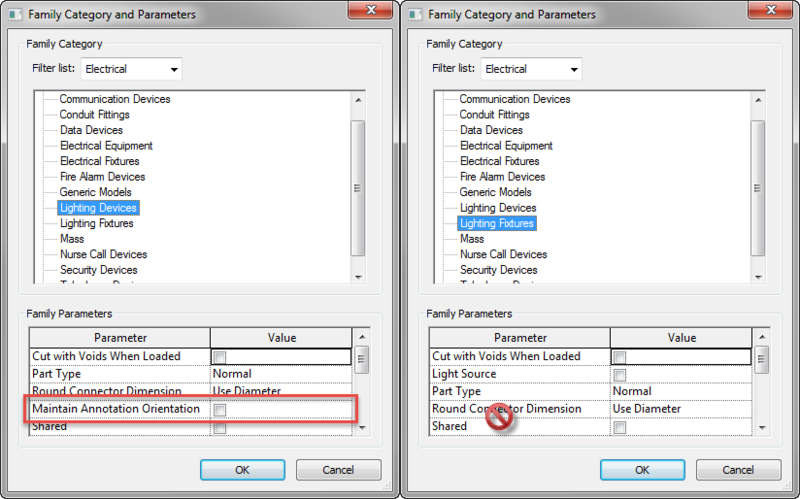 For example, you cannot do what is shown below on that single instance of the family just using symbolic lines. Opinions on option 2: Seems like a simple solution, until you consider the "I" in BIM. Good luck getting your lighting fixture schedule to work correctly. Or getting renderings using the photometrics for those wall sconces. Or isolating the lighting fixtures on the project. Opinions on option 3: This approach works. You will have to filter out the shared intermediate family to avoid seeing it in your schedules which is easy enough. However, I've also seen plenty of cases where the intermediate family is considered by Revit to be not hosted to a face and therefore showing in the Reconcile Hosting dialog. I've found that this approach confuses my designers when hosting goes wrong. Another issue is that the intermediate family instance in the host family is not visible in the family editor so family maintenance by someone other than the family author can be tricky. I recently read a post by Brian Mackey about creating a vertical face-based family template. The approach is that you create a family template started from a wall-based family template and convert it to face-based using Batch Copy/Monitor. The reason that Brian did this was so that the orientation of the hosting face in the family editor look like a wall. After I read the post I wondered what would happen if I placed a nested annotation family in a family created by that new template. I was pleased to see that nested annotation families are visible! And without the need to use a shared intermediate family. "And there was much rejoicing." Now, before you go crazy and start using this approach, I do need to caution you that when you use the process described by Brian, your resulting families will lose the use of the Default Elevation parameter. You will still be able to use the Elevation parameter to change the elevation of the element, but you cannot assign a default elevation. Sadly, the Default Elevation parameter is listed in the element's instance properties so this could potentially confuse your designers. You will have to decide if the loss of the assignment of a default elevation is worth the direct use of a nested annotation family in your lighting fixtures and electrical equipment. The majority of my wall-based lighting fixture and electrical equipment families that need annotation symbols currently use Jose's approach. However, the reconcile hosting issue is severe enough that I will be going back through those families and converting them to a template based on Brian's approach, despite the default elevation issue. I will finally have direct nested annotation families in my lighting fixtures and electrical equipment even without the Maintain Annotation Orientation parameter. 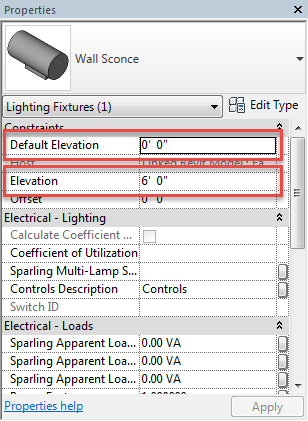 Use Default Elevation as height parameter is one way to have default elevation, but Elevation will be confused. Furthermore, ask past clients the amount they were charged for comparative project needs. This guarantees you'll be guaranteed a reasonable cost from your electrician.